Opposition Whip Parliament of New South Wales The Hon. 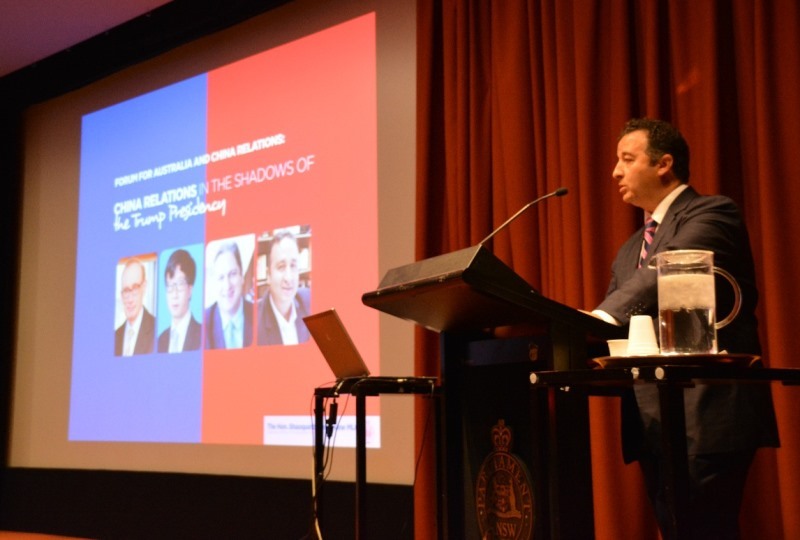 Shaoquett Moselmane MLC hosted a Forum on Australia China Relations Under the Shadows of the Trump Presidency at NSW Parliament on Friday, 28 April 2017. Guest speakers was Prof. The Hon. Bob Carr, Prof. Hong Chen and Tim Harcourt. The event was hugely successful and Great attendance. Before I begin I would like to acknowledge the traditional owners of the land & pay my respects to their elders past and present. Thank you all for being here today, I know some of you went to great length to be here and some even took a day off from work to be with us. So it is very much appreciated. I am sure you will not be disappointed as you have here a Very distinguished panel of speakers I am proud to associate with. This forum will provide an informative and timely discussion of Australia’s place in the foreign policy landscape across the next four years and possibly eight. So without naming individual guests I would simply welcome you all and thank our excellent panel of speakers for taking part in today’s forum and to share their thoughts about Australia's Chinese relationship under the shadows of a Trump presidency. As we’ve seen in the last week, Australia’s place in the new geo-political environment is uniquely sensitive – our economy hinges on China, our top trading partner while our national security and defense relies on our ANZUS alliance with the United States. Australia is the largest ‘Western’, society located within the Asia-Pacific region with deep political and cultural association with Great Britain and Europe. But Australia as a Modern Multicultural Society has made significant headways into Asia through astute Australian leadership such as Former PM Paul Keating and before him Gough Whitlam. It was Australia’s Gough Whitlam who broke barriers and was the first major Western political leader to visit the People’s Republic of China in 1971. And this was before National Security Advisor Henry Kissinger’s secret visit on behalf of the US. Since then, our engagement in Asia and with China has only grown with respect, stature and trust. The Chinese Leadership understood Australia’s place vis-à-vis the U.S and its dependence on ANZUS and did not seek to muddy the waters. The Chinese saw Australia as a future partner, but more importantly the Chinese Leadership was busy developing the Chinese economy and in the process redistributing wealth and bringing hundreds of millions of its citizens out of poverty and into the 21st century. I personally admire their tenacity and work ethics. From a personal perspective I can only congratulate all of the Chinese leadership since the revolution for achieving what they have today in a span of about six decades. And Thanks in part to the Chinese and their demand for iron ore; Coal and other minerals for ensuring that the mining boom continued sparing Australia from the ravages of the Global Financial Crisis that we saw in the US and other parts of the world. In fact Australia’s business with China has grown and continues to expand and diversify. China Australia grew with little hindrance. In 2015-16 China was the number one customer for Australia’s goods worth $75.3 billion, accounting for 30.9 percent of total Australian goods exports. In 2015-16, China was the number one customer for Australia’s services worth $10.7 billion, accounting for 15.6 percent of total Australian services exports. Over the last five years Australia’s total goods and services exports to China increased by 21 percent. In 2015 China’s stock of direct investment in Australia was worth $35.2 billion, 4.8 percent of the total from all countries. In 2016 Australia hosted 1.2 million tourists from China. In 2016 China was the top source market for international students with 196,052 enrolments, comprising a 27.5 percent share of the total. By 2025 Chinese tourism expenditure in Australia is expected to reach $34.3 billion, accounting for 60 percent of the growth in real tourism expenditure from all countries. So what we see in this snapshot is the depth and breadth of economic and trade interests that exist between our two nations. On the political side of the ledger, China Australia relationship is stable and has matured. It is one based on mutual respect and cooperation. According to Former Prime Minister Paul Keating China has a genuine claim for that respect. He notes that China's rise is "completely legitimate". With greater China Australia cooperation come greater responsibilities and so the question arises: How will Australia balance its relationships and commitments to our biggest trading partner and our most important ally the United States? Perhaps our speakers will attempt to address this question. Now, the last 100 days have given us some insight into the Trump Presidency. That’s not to say that people now understand it. The only thing one should now expect is the unexpected. The Trump administration has been described as one lacking policy predictability and politically volatile in policy making. The decisions and the back flips made by President Donald Trump on trade, on currency and on his relationship with world leaders, much of it on twitter, define the unprecedented volatility of foreign policy politics Australia and China and the world now face. To many commentators, Trump makes erratic and ill-informed statements. He once said for instance that NATO is "obsolete" apparently because in his view it doesn’t fight terrorism. He is seen at times to lack all sense of diplomacy as he regularly tweets and insults leaders about Fake News and takes journalists on and attacks and makes wild statements and has no qualms, no hesitation in using deadly force as we’ve seen in Afghanistan where he ordered the use of the Mother of all powerful non-nuclear bombs and his ordering of Tomahawk attacks on Syria and the heavy deployment of warships over the current North Korea Crisis. This has prompted many to write about global turmoil and the possibility of wars between U.S and China. Take for instance Graham Allison’s book “Destined for War" or articles such as that in the National Interest titled: "How America and china could stumble to War". Other journalists such as Jeffrey Goldberg from The Atlantic wrote on "Donald Trump and the Threat of Nuclear War." President Trump has attracted much criticism from within the United Sates as ignorant, irrational populist and so forth. Gareth Evans, our former Foreign Minister was similarly forthright in a recent address in which he described Trump in not too different terms. To some others though Trumps Presidency has its benefits. 3. America’s retreat could allow for china’s strategic Dominance. Furthermore it is argued that Australia Could benefit from Various Trump policies such as the Trumps travel ban. Well, according to Sam Perkins, President trumps travel ban will have a negative effect on immigration to the United States that Australian Universities are well placed to benefit from. Others such as the OECD, see Trumps administration could potentially rev up Global Growth faster than anticipated. Even the IMF head says Trump could benefit the U.S economy. Well, we soon hear from our guests where the trump card is for Australia and China. • Following this, there will be a Q & A session where the speakers will answer your questions. • So I encourage everyone to grab your pen and paper and take down some notes, participate and make the most of our panelists’ expertise! • Professor the Honourable Bob Carr. • He really needs no introduction but he was the longest continuously serving Premier in New South Wales history, serving across 10 years and achieving important outcomes on infrastructure, the economy, education and hosting the 2000 Olympic Games. In March 2012, Bob returned to politics when elected to the Senate and was appointed by Prime Minister Julia Gillard as Australia's Foreign Minister. Stepping down in 2013, Bob is now a Professor in International Relations at the University of Technology Sydney and the Director of the Australia-China Relations Institute. Please join me in welcoming to the stage former Premier of NSW and Foreign Minister, Professor the Hon Bob Carr. • Prof Chen is Chair of Department of English Language and Literature at East China Normal University in Shanghai (or ECNU), often referred to as the ‘Columbia of the East’, and is also their Director of the Australian Studies Centre. Professor Chen has been an expert commentator in Australia-China foreign relations in across Australian and Chinese media and journals for many years on issues of trade, cross-cultural education and Australian literature. In his areas of expertise, he is also Editor-in-Chief of the Website of Australian Studies in China, and Deputy Editor-in-Chief of The Journal of Studies of Australian Culture, and Journal of Australian Studies in China. Please join me in welcoming him to the stage. • Finally, we have Tim Harcour. • Tim is the J.W. Nevile Fellow in economics at the UNSW Business School, and an economic advisor to the Government of South Australia on international engagement. He was the Chief Economist of Austrade until 2011, and worked for the ACTU, the Australian Industrial Relations Commission and the Reserve Bank of Australia before that. Tim is an active economics commentator in Australian, Asian and international media on economic and trade issues across emerging markets in Asia and Latin America. 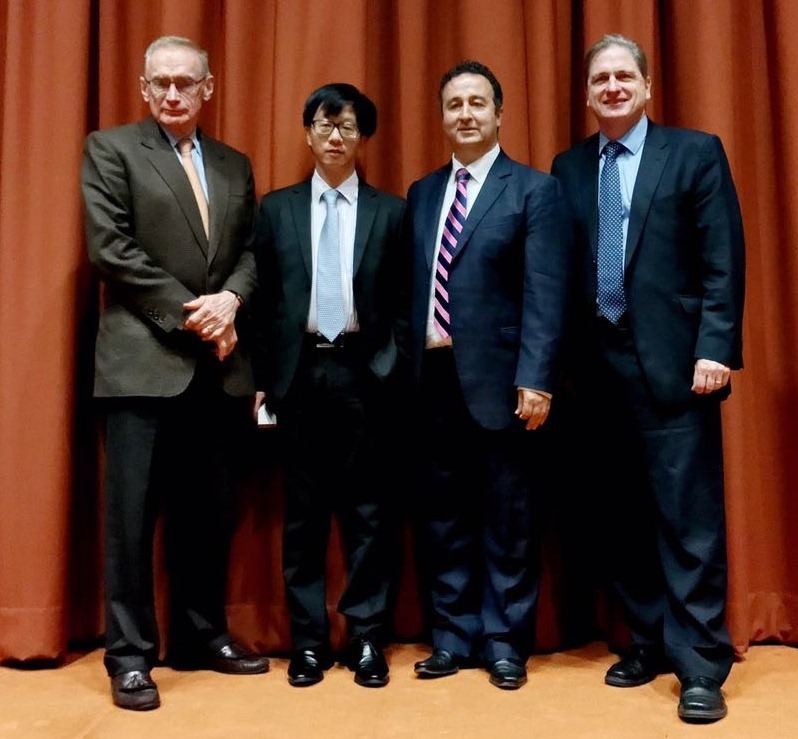 In closing I would like you all to join me in thanking our wonderful speakers for their most informative presentations. I would like to take this opportunity to thank a number of my friends who helped make this event a success including Jenefer Kwok, John Zhang, Jeantette Wang, Robyn Hu and Kenrick Cheah as well as my staff Jimmy, Louay and Trish. Thank you and I look forward to seeing you at a future event. • Prof Chen Hong: “In spite of the sporadic outbreak of the outdated cold war mindset, China Australia relations are developing with confidence and maturity. China is willing to collaborate with key partners such as Australia to remote regional and world peace and stability, and economic cooperation and development. • Shaoquett Moselmane: “China Australia relationship is stable and has matured. It is one based on mutual respect and cooperation. "